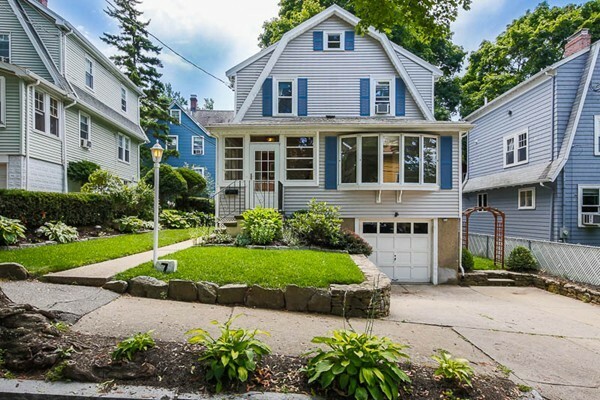 Beautiful 3 bed Dutch Colonial on tree lined, dead end street located directly across from Arlington Reservoir Beach! Enjoy a quaint neighborhood while being close to it all- MBTA, Bike Path,Trader Joes & shops/restaurants.This home has been tastefully updated & is ready for you to move right in! Large enclosed porch makes a perfect mudroom- a feature many homes are missing! Formal living room w/french doors & wood burning fireplace flows into dining room with crown molding, chair rail & built in hutch. Sunroom off living room w/bay window perfect for playroom/office/den. Beautiful Eat In Kitchen w/updated Shaker style cabinetry, granite, stainless appliances & glass tile backsplash. Composite deck located directly off kitchen leads to beautiful patio & sweet yard. 2nd level features 3 beds & updated bath with marble flooring & subway tile. Add'l features/updates: garage, irrigation, updt windows, heating, water heater, custom radiator covers & 200 AMPS. A perfect place to call home!